The Great Dane is intelligent, affectionate and gentle. 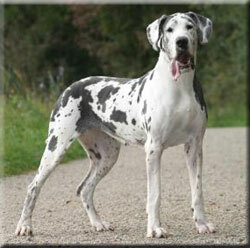 Great Danes are often referred to as 'gentle giants' and make excellent family companions. They get on well with people of all ages and other household pets. Great Danes are people orientated, sensitive, intuitive and slow to anger. They thrive on human company and make good watchdogs. Great Danes do need training from a young age, as they grow into large dogs very quickly and need to learn not to pull on a lead. Little attention is needed for the Great Danes coat. Using a rubber brush to remove dead and loose hairs during moulting is sufficient. These dogs need a soft bed to avoid pressure marks. These strong dogs need plenty of exercise and open spaces where they can run and play freely. Running alongside a cycle is a good way for them to get exercise, so long as they don't go running ahead. It is important that Great Danes are not over-exercised during the growth period. Great Danes have a demanding appetite. They are a fast-growing breed and need careful attention with their nutrition while going through the growth stage. Their name came from the French word 'grand Danois' which means 'big Danish' and it is unknown why the British adopted this name when the breed originated in Germany. It is believed that the Great Danes mastiff family originated in Asia as far back as 3000 BC, as there were Egyptian drawings of 'tiger dogs' similar to the Great Dane. This breed became well established when Greece and Rome were the main powers of western civilization. They were later known in central Europe as the German Mastiff or the Boarhound. General Appearance: Giant, calm and graceful. Color: Blue, black, fawn, brindle or harlequin (white with torn black splashes). Coat: Glossy, short and thick. Tail: Set high, tapering and carried in a straight line level with the back. Ears: Medium size, triangular, set high and folded forward. The ears may be cropped within some countries. Body: The body is deep and broad with well sprung ribs. The back is short and firm with a full croup. The shoulders are long and sloping and the belly is arched. It is said that someone can easily break into a house that is watched over by a Great Dane, but that they can never get out. Like other Mastiff type dogs the Great Dane is very tolerant of pain and therefore injuries or illnesses can be overlooked for long periods of time.